Crown7 Nicotine Hit-Stick | OhGizmo! 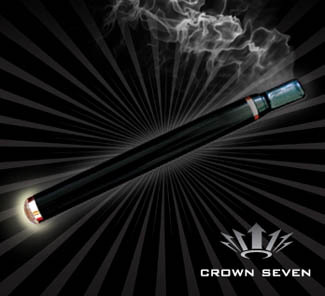 The Crown7 electronic cigarette delivers your hit of nicotine whenever you need it. Just turn it on, pull it to your lips and take a drag of your favorite body chemistry changing drug; it’s a lot like the real thing, sans the fire. No longer will the masses be forced to drag around boxes of highly taxed death sticks or be forced in to submission by fire; this electronic cigarette delivers a statement on your ability to both scoff at the smoking bans and announce your over-dependence on an outside chemical to the world. Available in a sleek narco-stick (100$) format as well as the more elegant pipe (150$) and the basic cigar (67$). Replacement Nicotine cartridges run about 10$, less if you buy in bulk. The high price may offset some, but if you’re buying cigarettes, you should be used to extreme price gouging already. Seen this product all over the internet, it looks crazy, I really want to try one out. Just got an e-cigarillo from another brand, have not smoked a real cig in 4 days. Great product, IMHO, but I’m sure the government is going to regulate them to death here in the good old USofA… I’m ordering enough to ratchet down my nicotine over a years time (carts come in high, med, low, and no nicotine), plus a couple of extra full kits in case they do start taxing them to death. Check out Crown7's new model called the HYDRO. Its the size of a regular cigarette and is the most reliable ecig on the market.